Hey AT&T–What’s The Deal At Fenway? I was astounded that as soon as I walked into the ballpark my data service (and possibly my phone service) disappeared. We spent the weekend in Boston watching the Phils play the Red Sox at Fenway. I was astounded that as soon as I walked into the ballpark my data service (and possibly my phone service) disappeared. This happened Saturday and Sunday though we sat in different parts of the ballpark both days. The limitations of the 3G network were readily apparent at Boston’s Fenway Park during a Red Sox game last week. Signal was consistently 4 bars, but the data network was totally non-responsive. That’s my story… except it was written in 2008 and posted on Gigaom. This is a long standing problem. Here’s another person with the exact same complaint as mine from Apple’s website. You know what’s interesting… I was at Fenway Park in Boston yesterday. I had full bars on 3G, completely max’d signal as far as the phone was concerned. And with all of that signal, I could not get to a single web site or even send a text message. 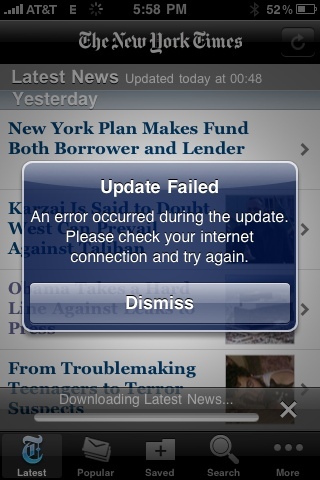 I kept getting errors sending data as well as timeout errors when trying to hit a web site. It’s from July 2008 and, again, my story exactly. More recently commenter writing about the iPad ban at Yankee Stadium added this about Fenway. when I’m in my seats at Fenway Park with my iPhone, I get NO service. Not even EDGE. Even a voice cell call from Stef went directly to voicemail while I was at Fenway. I got notice of the call only after we were walking back down Brookline Ave. It seems difficult to believe at&t doesn’t know this exists. How could they not? Recently at&t announced they were eliminating their “all you can eat” data plans for the iPhone. Maybe a nice gesture would be for them to stop signing new customers until they built a network that could handle the ones they’re collecting money for now. It’s been like that the last 2 years for me at Fenway with the iphone. Very annoying. The worst is trying to get a radar image during a rain delay on your phone! I heard that a lot of sports places have a ban on cell phones and such devices because otherwise whats the point of having their own cameras and news crews with modern technology at the spectator’s hand? AT&T and other service providers might be in cahoots with places like Fenway, intentionally blocking/scrambling services. Is it possible that they might using some kind of cellphone suppressor to jam that kind of service like they supposedly use during the Superbowl and during the Daytona 500? A friend of mine mentioned that to me when we were there that there is some kind of way to do this and it is to thwart terrorist attacks. Not sure if it’s true or not. In response to Paula and Tori cellphone jammers are quite illegal in the US. There are a variety of reasons beyond the law at&t would never condone this. The operation of transmitters designed to jam or block wireless communications is a violation of the Communications Act of 1934, as amended (“Act”). See 47 U.S.C. Sections 301, 302a, 333. The Act prohibits any person from willfully or maliciously interfering with the radio communications of any station licensed or authorized under the Act or operated by the U.S. government. 47 U.S.C. Section 333. The manufacture, importation, sale or offer for sale, including advertising, of devices designed to block or jam wireless transmissions is prohibited. 47 U.S.C. Section 302a(b). Parties in violation of these provisions may be subject to the penalties set out in 47 U.S.C. Sections 501-510. Fines for a first offense can range as high as $11,000 for each violation or imprisonment for up to one year, and the device used may also be seized and forfeited to the U.S. government. I’ve had the same problem at Yankee Stadium. Last year at the World Series, and game 4 of a four game set with Boston my phone would not work at all. Shows full 3G service but is completely dead, I was able to get a few texts out if I was lucky. At lower profile games where attendance isn’t as high there isn’t an issue. AT&T has the ability to bring in “mobile towers” for big events when thousands of people will be in one place, but they don’t seem to care. My favorite part was looking at all the AT&T promotional stuff around the field while my iPhone was useless. Thanks, Geoff. I wasn’t sure that was true, especially at Fenway because when you watch the games on TV you always see the yahoo’s behind home plate on their phones. It’s not cellphone jammers; phones using other carriers don’t suffer the same signal suffing as AT&T phones, specifically iPhone, does. Without the free wifi at Fenway, there’d be no link to the outside world. Don’t bother taking your ATT phone with you if you ever visit Wudzee in Santa Fe; switching one of my numbers to Verizon this week as a result of my last visit! I had no problem getting cell phone signals and accessing the internet with my Verizon phone in and around Fenway Park (including the Cask ‘n’ Flagon). Sounds like Verizon could capitalize on that. There are simply too many people in a single area trying to use their phone at the same time. It overloads the network. I frequently have problems in Boston such as many, many dropped calls. I have heard it is because there are so many iPhone’s in use in a concentrated area. Completely shutting your phone off and restarting can help…but it didn’t help me at Fenway. Roundface: If you’re right (and you probably are) the larger question is why is it our problem and not at&t’s? If they have capacity problems in Boston why is the city plastered with ads everywhere for the iPad and why is at&t allowed to sell more non-existent service? Exact same problem here, have had it at many sports arenas. Was at Fenway yesterday with full 3G bars but could not receive or send data. Restarts didn’t help. I have also had this problem at Dodger stadium, Staples center (Lakers) and Qualcomm (San Diego Chargers). It seems that it is iPhone in particular with this problem because I have seen others with AT&T and smartphones with good reception. My theory is that it could be related to many phones in close proximity overloading the network, possibly related to the way that when the iPhone is placed near a radio or computer it buzzes loudly due to interference. Whatever it is it is frustrating. Same problem for me. I’ve gone a few times this month and every time it is the same issue. It has to be a network overload, because it works find before the game but stops once the place is packed. I notice the same thing at any sporting event. What takes the cake is when my friends, at the same game…with Verizon, text me, and I don’t get it until literally walking outside the gates of the park. AT&T needs to fix this. Note- it should be better as of now. AT&T just launched a Distributed Antenna System inside Fenway Park on Friday (7/2/11). All is now well!